"Often considered among the most important and valuable pieces of furniture in the room, tea tables, candlestands, and other forms present refined architectural features like dish tops, turned pedestals, finely shaped and carved legs and feet. In contrast, some of the most charming tables are also the most primitive. It's all in the objective of the maker. 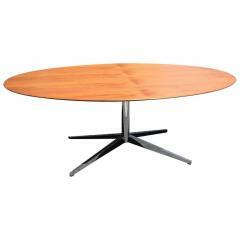 If there is a table you are looking for and do not see, please call or email, we may not have cataloged it yet." 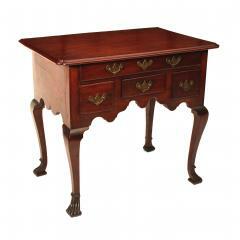 Philadelphia tiger maple Queen Anne dressing table. One drawer over two, original plate brasses. Cabriole legs terminating in a faceted foot. Nicely scalloped aprons. 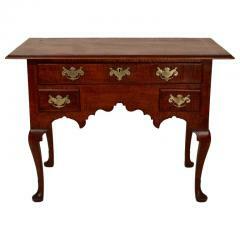 Walnut Chippendale Pembroke table. Drawer with bale and rosette brass pull, frets and Marlborough legs with X stretchers. Great size. 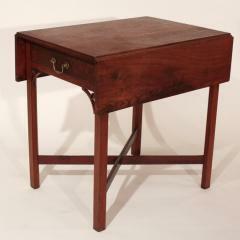 Philadelphia mahogany Chippendale card table. Rectangular top, drop pendant on apron, cabriole legs terminating in claw and ball feet. 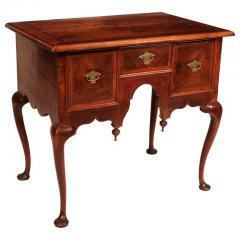 Rare walnut Queen Anne dressing table. Veneered top with herringbone, aprons and three drawers. Original engraved brasses. Scolloped aprons with two drop finials. Cabriole legs terminating in pad feet. 18th century English mahogany pier table serpentine front with carving along edge of top as well as the mid molding pierced frets and Marlborough legs terminating in block feet. 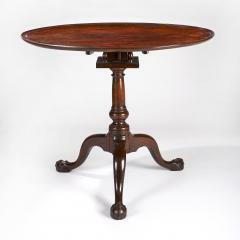 18th century Philadelphia mahogany Chippendale tea table with beautiful figured grain on top bold suppressed ball pedestal cabriole legs terminating in claw and ball feet. 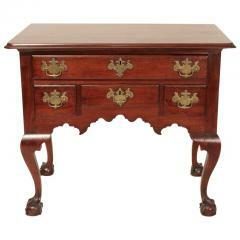 Philadelphia mahogany Queen Anne lowboy with one drawer over three configuration scalloped base and terminating in faceted feet. 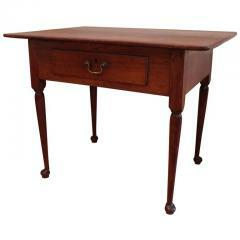 Rectangular top with one drawer bale and rosette brass, turned legs terminating in pad feet. Walnut conference table made by Knoll furniture in the 1970s. 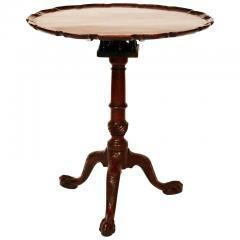 Mahogany Chippendale dish top tea table, bird cage with suppressed ball pedestal, cabriole legs terminating with claw and ball feet. Beautiful figured graining on the top. 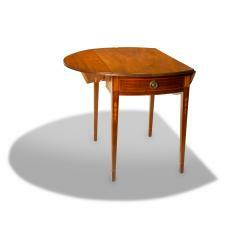 Very rare walnut Chippendale tea table most likely Chester County. Bird cage with suppressed ball pedastal, terminating in a most unusual carved foot. 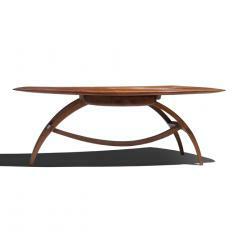 Wonderful walnut Amoeba table by renowned New Hope furniture maker George Nakashima. Figured free form top with turned legs. This Walnut Queen Anne dressing table has a molded top with notched corners and cabriole legs terminating in Spanish feet. 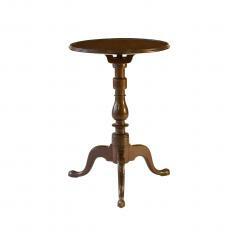 This is a highly desirable Philadelphia candlestand form. 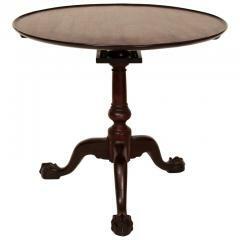 This candlestand has a dish top over a bird cage, suppressed ball pedestal and cabriole legs terminating in snake feet. 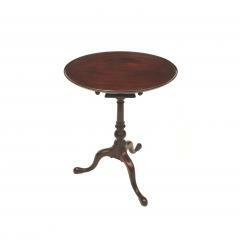 This Mahogany Queen Anne candlestand has a dish top, a bird cage, suppressed ball pedestal and cabriole legs terminating in snake feet. This is a very unusual candlestand made from maple and oak. 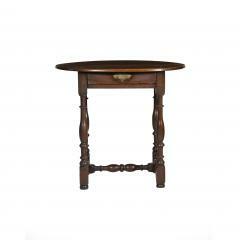 It has a stationary oak dish top, maple turned urn shaped pedestal with three maple turned legs. 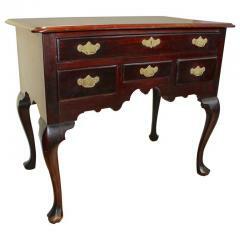 This Mahogany Queen Anne dressing table has a molded top with notched corners. Scalloped aprons add elegant form associated with the Queen Anne period. 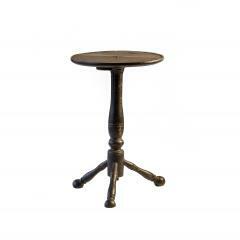 The table is elevated by cabriole legs terminating in Spanish feet. 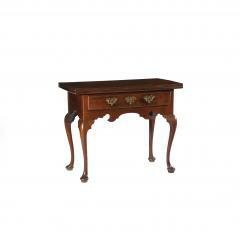 A well conceived dressing table with nicely molded top with four notched corners. The drawer formation is one drawer over two. Scalloped aprons add elegant form associated with the Queen Anne period and are complemented by replaced brasses. 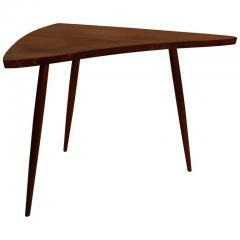 The table is elevated by cabriole legs terminating in Trifid feet. 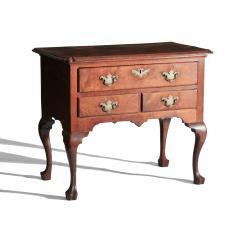 A slightly smaller form of the pembroke style with an oval dropleaf molded top, a single inlaid drawer (with faux drawer on opposite side), nice bookend and icicle inlay flank the drawer and adorn the tapered legs. 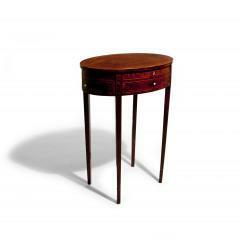 A very fine oval sewing stand with line inlay, a lift-lid and two drawers over tapered legs. 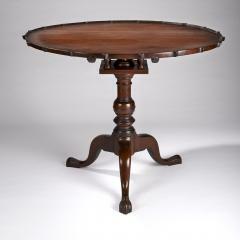 A truly exceptional tavern table of diminutive and highly turned proportions. 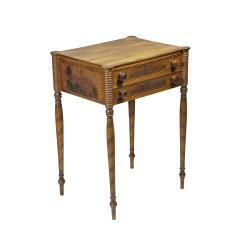 This table is representative of early Queen Anne sophistication. 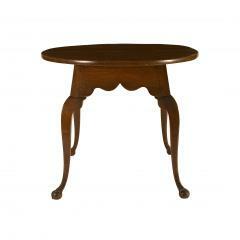 An unusual oval top rests over a one drawer base with scalloped apron, four nicely turned legs with turned H-stretchers over ball feet. Sometimes a singular piece comes into our possession. This is one of those pieces. The finely molded dish top on this candlestand is supported by a most unusual birdcage above a nicely turned vase pedestal with cabriole legs terminating in snake feet on pads. 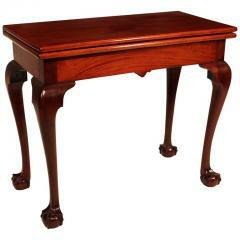 An elegant four-legged tea table with tray-top, a scalloped apron, cabriole legs with beaded edges and stocking feet. 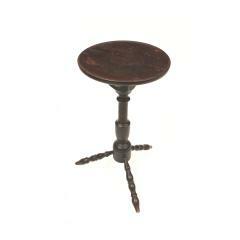 Candlestand with circular top, turned pedestal, three turned legs and ball feet. Black paint is not original. Dish top, highly turned birdcage, turned vase pedestal and cabriole legs terminating in snake feet. This charming and rare tavern table has unusual grace. With nicely scalloped aprons and four splayed cabriole legs terminating in claw-and-ball feet. One similar to it is pictured in "Southern Antiques" by Paul H. Burroughs (plate 3 under tables). Two knee blocks replaced, two aprons are spliced.